Finding used cars for sale has never been easier with our new pre-owned car facility at 115 Auto Park Circle in Woodbridge! 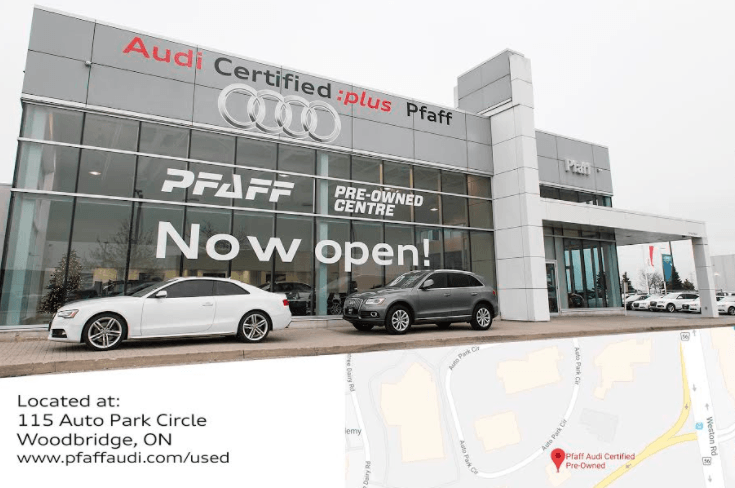 Pfaff Audi Vaughan has recently opened our new used car lot to the public, and if you are looking for used Audi vehicles for sale, this is the place where you need to be. Whether you are looking for an SUV, coupe, sedan, sports car, or convertible, our pre-owned car facility has got the selection you need, and best of all, it is right around the corner from our new car dealership! Read on for more information about some of the Audi vehicles that you can find at our new pre-owned car facility at Pfaff Audi Vaughan. Looking for something on the smaller scale? Are you still looking for style, sophistication, and performance? Well if so, this 2015 Audi A3 2.0T could be of interest to you! Currently available at our new pre-owned car facility in Woodbridge, this premium quality used Audi A3 will not last long! Schedule your test drive in this optimal driving machine on our website, or by contacting an Audi representative today! Trying to find a vehicle on the larger scale? Have you looked around at other options, but you just can’t see past the luxury, style, and power, that you would get with an Audi SUV? Consider this 2015 Audi Q3 2.0T at our pre-owned car facility today. This quality SUV will provide you with towing power, spaciousness, intuitive interior technology, and most importantly, safety. Contact an Audi representative at our pre owned car facility to schedule your test drive, or book your appointment on our website. Is it that time in your life where you are considering purchasing a sports car for yourself? Well Pfaff Audi Vaughan has got what you need at our pre-owned car facility at 115 Auto Park Circle. Customers can find used cars for sale like this 2016 Audi S7 4.0T sports car! You will turn the heads of onlookers while you are driving this premium quality Audi vehicle. This 2016 Audi S7 4.0T is just one of the vehicles available at our used car facility. Schedule a test drive in this vehicle today, or come on in and check it out. We’re waiting for you! For more information about the used cars for sale at our new pre-owned cars facility at 115 Auto Park Circle in Woodbridge, or for more information Pfaff Audi Vaughan, please feel free to continue browsing through our website. Click here to find our contact information and to fill out our contact form.